The romantic story of the steam-engine is well known, from the time of Watts’s kettle to Stephenson’s locomotive, and the struggles and triumphs have been handed down as among the most important factors influencing civilization. But, as in all ages, these pioneers had to contend with the scepticism and conservatism of human nature – opposition which was only crushed by dogged perseverance and heroic faith. The victory of steam for utilitarian purposes has been complete, and therefore we no longer see a single sail (nor even the spars to set one) in all the navies of the world, and very few in the mercantile marine. But the case has been widely different in yachting. Despite the enormous improvements that have been made in the marine steam-engine, we still have a splendid fleet of sailing yachts, to which additions are made every year. Smoke, coal-dust, and waste of space have been the three factors that have fought against steam in the minds of yachting men. These have already been largely overcome, but even yet steam cannot claim a complete victory. It was shortly after the invention of the steam-engine that the attention of shipbuilders was drawn to the possibilities of this motive force for the propulsion of marine vessels, and all the earlier attempts at marine engineering are associated with the Clyde. It is mainly owing to this early enterprise that the great marine centre owes its strong position to-day. Those who were responsible for it saw far ahead, and staked their reputations and fortunes, not on any chance scheme, but one that, in capable hands, was a certain success. When Mr. Henry Bell, a Glasgow house-builder, conceived the idea of building the Comet, he entrusted the construction of the boiler and castings to David Napier, the son of a blacksmith. Himself a blacksmith and inventor, Napier at once saw the possi­bilities of steam propulsion for ships, and, after instituting a rough form of tank experiments with a view to finding the form of least resistance, he handed his model to the shipbuilder who built the Rob Roy. This vessel he engined, and she was a success, and plied regularly between Greenock and Belfast. She was subsequently purchased by the French Government. In the Blue Books of the British Government it is put on record that Napier’s steamers were the first to demonstrate the practicability of navigating the open sea by steamer. Napier also invented the surface condenser, the feathering paddle, and twin screws; but, owing to a disastrous explosion on one of his steamers, he removed from Glasgow to London, and after a few years retired. His yard was taken by Mr. Scott Russell for the building of that wonderful enterprise, the Great Eastern. It is also worthy of note that this ancestor of the internal combustion engine builder of the present day invented and ran a steam car for his on use and for hire. In 1821 Robert Napier, who was also a blacksmith, took over his cousin’s works in Glasgow, and, with David as his manager, he founded a business which was destined to influence this country and the world. Opposition, failure, and disaster met this wonderful man, but, by dogged perseverance, he bore down each obstacle, and every reverse found him more convinced of ultimate success. In 1823 he received his first order, and the engines of the Leven were the result. In these historical engines he introduced the air-pump and slide-valve, and, after outlasting three hulls, they were erected in Dumbarton Castle as a monument to his genius and scrupulous workmanship. The success of the Leven brought Napier fame, and his reputation for sound work assured him of the orders on which to display his skill. In 1827 he had a few rivals, among them the famous firm of Maudslay, of London, which passed out of existence some years ago. The influence of the two cousins Napier on the shipbuilding and engineering industry may be gathered from the list of great firms and men associated with them. Prominent among these may be mentioned Messrs. Denny, Messrs. James and George Thomson (now Messrs. John Brown and Co.), Messrs. John Elder and Co. (now the Fairfield Shipbuilding Co.), Messrs. William Beardmore and Co., Messrs. Smith and Rodgers (now the London and Glasgow Shipbuilding Co.), Messrs. Tod and M’Gregor (now Messrs. D. and W. Henderson and Co.), Messrs. Aitken and Mansel, Messrs. Napier, Shanks, and Bell, Messrs. Napier and Miller, Messrs. Scott and Sons, Messrs. Dunsmuir and Jackson, Messrs. Napier Bros., Messrs. G. L. Watson and Co., and others. ‘The Royal Northern Yacht Club, in their regatta in August, 1827, offered a cup valued at 20 guineas for the swiftest steamboat. The course was from Rothesay Bay round boats moored at the north end of the Great Cumbrae, and back to Rothesay. Several steamers entered the race. The contest was an exciting one, occupying nearly three hours; but in the end victory lay with Robert Napier’s steamers, the Clarence winning the cup, and the Helensburg coming in a good second. This apparently trivial incident was one of the most important events in his life, and had a material bearing on his subsequent career. ‘Mr. 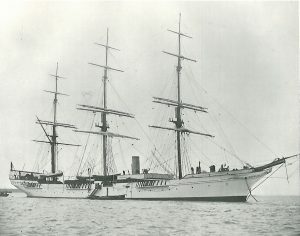 Smith was a strong advocate of hollow water-lines, and though Napier dissuaded him from them in the case of his first yacht, he insisted on them in the Fire King. 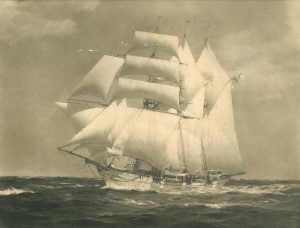 She proved to be a very fast boat; but, before her trial, Mr. Smith was so confident of her success that he made a public challenge in Bell’s Life to the effect that the vessel would run against any vessel then afloat from Dover Pier round Eddystone Lighthouse and back for 5,000 guineas, or a still higher sum if required. Regarding the hollow lines there was a somewhat heated controversy between Mr. Smith and Mr. Scott Russell, who claimed to be the discoverer of the “wave principle,” for which he received a gold medal from the Royal Society of Edinburgh in 1838. Mr. Smith, on the other hand, while not professing scientific knowledge, contended that he was the introducer of these lines, as he had adopted them in one of his sailing-yachts built more than ten years previ­ously, and he had constantly pressed their adoption on the builders of all his steam yachts. ‘Mr. Smith was on intimate terms with the Duke of Wellington and other members of the aristocracy, and he was of much assistance to Napier in his subsequent dealings with the East India Company, the Admiralty, and foreign Governments, being always ready to give his name for him as security in the largest contracts. ‘When the Duke of Wellington was staying at Tedworth, Mr. Smith communicated to him his ideas regarding small gunboats for coast defence. The conservative Duke was so impressed that he advised him to write his views to the First Lord of the Admiralty, which he did. Having had no acknowledgment, Mr. Smith, meeting him one day, inquired if he had received his note, to which question the official replied in the affirmative, but added that the First Lord could not pay attention to all the recommenda­tions made to him. Upon this Mr. Smith took off his hat, and, making a stately bow, remarked, “What his grace the Duke of Wellington has considered worthy of attention, I think your lordship might at least have deigned to notice.” Within a few years his suggestion was adopted, and a formidable fleet of vixen craft, many of them engined by his old friend Napier, did good service in Chinese waters. Mr. Smith died in 1858. While the evolution of the steam yacht practically coincides with that of marine engineering generally, the factor values differ considerably. In the mercantile marine two problems are pre­eminently important – a vessel must carry a maximum cargo with the minimum expenditure of fuel and labour, or else she must carry the greatest possible number of passengers at the highest speed. Neither of these considerations exist in the case of the steamer which is designed for pleasure. Comfort is the ideal, and the other considerations are of but secondary importance. The points to be studied in the designing of steam yachts are consequently somewhat at variance with those which enter into the calculations of those who confine their attention to the requirements of com­merce. A good sea boat is of the greatest importance, and in combination with that must be found the maximum accommoda­tion for the given size. Combined with these qualities economical fuel consumption is generally aimed at. Some yacht-owners aim at speed, but, as a general rule, fast passages are not required, and it is but natural that when one goes to sea for pleasure a speedy return is seldom required. The Sunbeam. Rt. Hon. Lord Brassey. K. G. B.
other; and, while this is true to some extent, the type of yacht is most serviceable for long voyages. With the invention of the Bevis propeller – the invention of Mr. Bevis, of the famous Birkenhead shipbuilding firm of Laird Bros. – a considerable impetus was given to the building of auxiliary steam yachts in this country. 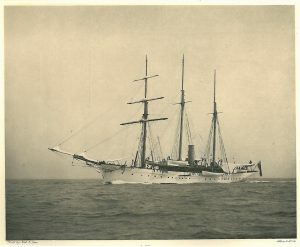 Sunbeam, built in 1874, was one of the first to be fitted with one of these, and she was, and still is, a marked success. Her fame is world-wide, and the long voyages which she made were most economically carried out, owing to the fact that her steam power was only requisitioned when the wind did not serve. In this way an auxiliary allows of the comfortable and easy conditions of a sailing – vessel without being inconvenienced by calms or close waters. Valhalla, S. Y., 1,490 tons. The Earl of Crawford. out by Mr. Byrne – e.g., Arcturus (4.74 tons), built, in 1895, for Mr. Rutherford Stuyvesant; the Miranda (582 tons), built in 1882, now the property of Lord Leith; and the Norseman (521 tons), built, in 1898, for Mr. S. R. Platt. In 1894 Mr. Watson designed La Belle Sauvage (743 tons) for Lord Gordon-Lennox. She is now owned by Mr. J. B. Robinson. The Semiramis (703 tons), now owned by Mr. Henry Walters, of Baltimore, and known as Narada, was designed by Mr. A. H. Brown in 1889 for Mr. Lysacht, and the same designer turned out the Enterprise, née Star of the Sea (383 tons), in 1882. These are but a few examples of a type of vessel which obtained considerable popularity among yacht-owners prior to the beginning of the present century. That the type is still the most suitable one for extended cruising, where speed is not a consideration and economy is, is proved by the good work done by these vessels. The distances covered by the Sunbeam have been enormous, and are a striking example of the efficiency of the auxiliary yacht for ocean cruising. The progress made in the design and construction of the steam yacht is bound up with the more utilitarian steamship. Indeed, it is difficult in many instances to decide where the steam yacht ends and the steamship begins. The lines and proportions of the latest Cunard liners are in every way as graceful as those of the most celebrated steam yachts afloat, and the luxurious accommodation of these steamers eclipses the luxury of the ordinary steam yacht. As with the steam pleasure-yacht, so a remarkable change has been wrought in the evolution of the steamship. In this connection we may follow in the historic fleet of that remarkable line, the Cunard Steamship Company, the history of the shipping industry generally, and the advance of science in relation to the marine steam-engine, from the old paddle-steamer Britannia, with an indicated horse-power of 740 and an average speed of 8½ knots per hour, to the Lusitania and Mauretania, the latest leviathans of the Atlantic, fitted with turbine engines and steaming at an average sea speed of 24½ knots per hour. All this has been accomplished in a comparatively short period. It was in the year 1840 that the British Government completed a contract with Samuel Cunard, George Burns, and David MacIver for the conveyance of the mails between Liverpool and Halifax and Boston, and on July 4. of that year the famous Britannia started on her maiden voyage. If the Clyde has done much for shipping, it has also done much for yachting. No more keenly enthusiastic yachting families than the Burns and the Maclvers are to be found in the history of Clyde yachting, and with both sail and steam they have progressed steadily along those lines which have proved so successful with the ships of the Cunard fleet. The Britannia measured 207 feet in length, 34 feet 4 inches in breadth, and 22 feet 6 inches in depth. Four vessels were at first provided, but all that was most progressive and excellent in ship-building was pressed into service, and many of the old steamers, such as the Scotia, Persia, and the Russia, have become historic. Carmania. Cunard S. S. C. Ltd. 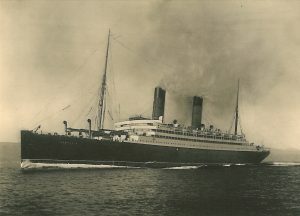 The Cunarders Caronia and Carmania are among the latest developments of the transatlantic steamer, fitted with luxurious accommodation for large numbers of passengers. These 20,000-ton steamers, though sisters in size and speed, differ in the respect that while the Caronia is propelled by engines of the reciprocating type, driving twin screws, the propulsive power for the Carmania is derived from turbine engines whose power is distributed through three shafts, each of which drives one propeller. The speed of the Caronia and Carmania, while less than that of the vessels of the greyhound class, enabled them to make the voyage between Queenstown and New York in six and a half or seven days. In the latest Cunard express turbine steamers, Lusitania and Mauretania, British shipping has achieved a marvellous triumph. They represent all that is superlative in naval architecture and marine engineering. Progress, it is true, has been distributed over sixty-five short years, and the evolutionary process has been so gradual that efficiency has not been sacrificed. Comparing these and the old Britannia, we see the uphill struggle in the march of time. Each of the 25-knot Cunarders are from twenty-five to thirty times the tonnage of the Britannia, and eighty-five to ninety times the power. And apart from their size, their graceful lines, and well-balanced proportions, their rotary or turbine engines have attracted the attention of the world. The new Cunarders make the voyage between Liverpool and New York in one-third of the time occupied by the old Britannia, and along one of their turbine-driven shafts there is transmitted six times the total horse-power developed by the engines of the whole pioneer Cunard fleet of four vessels. The progress of the steam turbine has been remarkable. The Hon. Charles A. Parsons, C.B., first startled the world with the little 100-feet Turbinia, which appeared at Cowes in 1894, with turbine engines and 2,000 horse-power. Contrary to its usual practice of following the mercantile marine, which, in turn, always follows the lead of yachts in any great mechanical departure, the Admiralty grasped the possibilities of this system, and built several turbine destroyers, and the first passenger turbine vessel was the King Edward, built for Clyde service in 1901. The Emerald, 800 tons, built for Sir Christopher Furness in 1903, was the first noted turbine yacht. The complete success of the system is well illustrated by the fact that, although great difficulties had to be surmounted, we find an advance in five years from the King Edward, of 560 tons and 3,500 horse-power, to the Mauretania, of 33,000 tons and 70,000 horse-power. There can be little doubt that the turbine arrived at a critical time, for the progress of the internal combustion engine has not been slow, and in all probability the future will show the turbine in use in large yachts, and the internal combustion engine in those of rather small size. The turbine has, in fact, given steam a new lease of yachting life. Download a pdf of this chapter here or read on … Chapter 14 – Colonial Yachting.